Everybody knows that happiness has many physical benefits. That is why they say, laughter is the best medicine. When we laugh it boosts the immune system and decreases the stress hormone cortisol. In fact laughing releases endorphins, serotonin, etc. and boosts our memory and ability to learn and create. “Gentlemen, why don’t you laugh? With the fearful strain that is upon me day and night, if I did not laugh I should die, and you need this medicine as much as I do.” -Abraham Lincoln. Happiness is a choice. Even in the darkest hours, you can still choose to be happy. Unfortunately many people believe that happiness is a result of something outside of themselves. Example, something or somebody must make them happy. Whilst it is true that having good relationships is conducive to creating a happier life, it is important to remember that happiness is always a result of your own internal choice of state. That is not to say one should always be happy. Of course there are times when it is appropriate to be sad for example. Although not the point of discussion for this article. Psychologists say that we have a happiness set point or “Hedonic treadmill theory” as it is known. What this says is that people will return to their happiness “setting” after a short period, whether something good or bad happened to them. The most popular class at Harvard University, taught by Tal Ben-Shahar, teaches students to train their brains to cultivate happiness. Many people are not happy at work and medical evidence suggests that it affects our memory and ability to learn. Stress at work can be very detrimental to team and staff performance. Leading to an unhappy work force and higher staff turnover. Furthermore it increases the risk of, anxiety, illness and potentially depression. We spend so much time at work, that it is very important to have humour and fun in the work place. It is a fact that happier workers have increased productivity. Having a happy workforce creates better teams, camaraderie and lower stress. These things in turn have a positive impact on clients and the overall business. See how you can make tasks more enjoyable and create an environment that people want to come too. 5 Things that blocks happiness? There are many things that can cause us to have feelings other than happiness. • Trying to keep up with the Jones’ for example. This can potentially create financial burdens. It also can lead to people not living their true self as they feel they need to fit in. • Playing the blame game. Blaming other people and situations for things that you are unhappy about. Nobody makes you feel unhappy. Take learning’s from every situation and interaction and use it to empower yourself. • Avoid trying to control everyone and everything around you. This can become very tiring and stressful. • Negativity and focus on things that do not support our growth. • TV and news stories about how bad things are. I very rarely watch the news or read a newspaper. It is usually filled with sensationalism and you very rarely hear about all the good that goes on in the world. 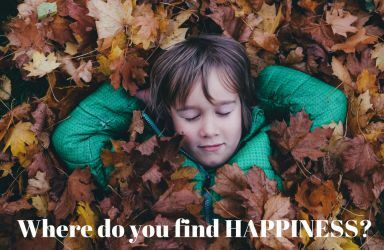 So what makes a person happier? • Various studies show that having good friends are more likely to recover from a disability. • Be content whether you are in a relationship or not. Being alone does not mean you have to be lonely and unhappy. Just like being single is not a life sentence of being unhappy. One can be happy being single or in a relationship. Happiness comes from within. • A German Socio-Economic Panel Survey, found that one of the best ways to increase happiness is helping others. • Happiness is an internal state. The beauty of that is that we can all control our states. Thus you can simply choose to be happy. Much of that has to do on your focus. If you focus on what makes you happy, then you can feel happy. • Simply putting a pencil between your teeth and forcing a smile can actually make you feel happier. A study by Laird, J.D. (1984) ‘Facial response and Emotion,’ Journal of Personality and Social Psychology. 33: 547-52, found that having a pencil between your teeth (creating a smile) made participants rate the cartoons as funnier. • Having an attitude of gratitude. Being grateful for what you already have increase happiness and actually helps you to be open too and appreciate it when you receive more. • Mindfulness and meditation can increase happiness. • Smile and the world smiles with you. Having a smile is contagious and as you smile, you will receive a smile in return. • Spending time with your loved ones. • Research shows that optimistic people tend to be healthier and happier. Stop buying into all the doom and gloom and be more optimistic. Happiness is a choice. You are the master of your thoughts and your state. Every cloud has a silver lining. Every day is a brand new day, with new choices and adventures. You have the choice to be happy; even when it seems like there is nothing to be happy about.